A PROPHETIC ARTWORK? 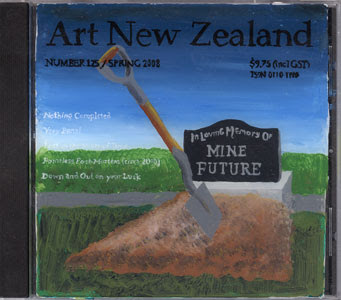 A REVERSE PAINTED CD CASE WITH CD PAINT PALETTE INCLUDED. 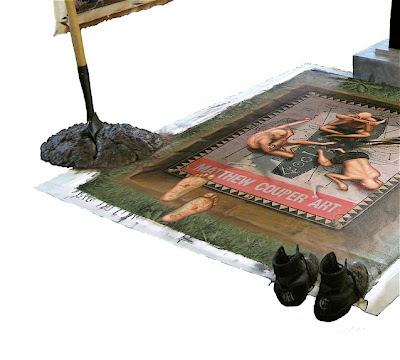 I DIDN'T PARTICULARLY WANT THIS AS I HAVE A THING FOR THE PRINTED WORK. RUMOUR HAS IT THAT THE FAT LADY HAS NOT YET SUNG, SO I'LL BE LOOKING FORWARD TO RECEIVING MY NEXT ISSUE, AS I STILL HAVE 2 ISSUES THAT ARE PAID FOR . MY REOCCURRING BACKACHE IS BACK WITH A VENGEANCE. I KNOW WHERE THE PROBLEM IS (UPPER RIGHT-HAND SIDE SPINE, 3 LAYERS OF MUSCLE DEEP) BUT I CAN'T GET TO IT, UNLESS I GO TO A MASSEUR. ALL I CAN DO IS STRETCH TO RELIEVE THE TENSION, ONLY A SHORT TERM FIX. 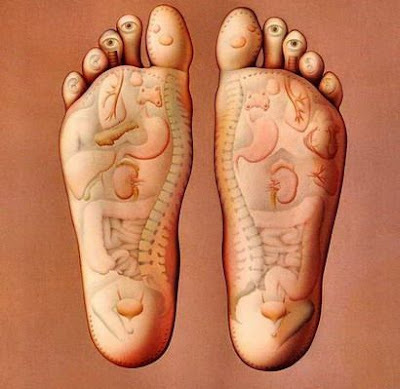 IN MARCH 2008, I WAS WORKING WITH A MASSEUR WHO WAS INTERESTED IN REFLEXOLOGY, MOSTLY THE FEET. THE CHART BELOW IS THE MOST ACCURATE FOR ME AT PRESENT AND I LIKE IT BECAUSE IT'S VISUAL. IF I CAN RELAX ENOUGH, I CAN WORK ON MY OWN FEET BUT THAT TAKES A TREMENDOUS AMOUNT OF ENERGY AS YOU NEED TO BE RELAXED, BUT AWARE OF WHAT YOU'RE DOING AT THE SAME TIME. I INCLUDED THIS CHART IN A LARGE RITUALISTIC PAINTING INSTALLATION I MADE AT THE START OF THIS YEAR CALLED THIRTY-THREE. THE FEET ARE FREED OF THE SHOES, AND WALK TOWARDS THE GRAVE AND ACTUALLY WALK ABOVE IT AS IF YOU WERE SKY-WALKING, SIMILAR TO THE GLASS SKY-WALK OVER THE GRAND CANYON. OF COURSE, YOU CAN SEE THE SOLES OF THE FEET, SO THE WHOLE IMAGE BECOMES FLIPPED 180 DEGREES AT THE POINT OF REALISATION.